Use analog circuitry to create a piezo electric siren that sounds like a WWII air raid siren. Air raid sirens were instrumental during the second world war by alerting citizens of impending bombing runs. In this DIY Hacking project, we will use all analog circuitry to create a piezo electric siren. How Does the Air Raid Siren Work? The circuit consists of two main sub-circuits: a LFO (low-frequency-oscillator) and a VCO (voltage-controlled-oscillator). The LFO circuit consists of U1A, U1B, R2, R5, and R7 with U1A being configured as a Schmitt trigger and U1B being configured as an integrator. With the output of U1A being 0V, the negative plate of C1 begins to discharge through R2 which results in a linear increase in output voltage from U1B (the rising edge of the triangular wave). Eventually, the triangular output wave becomes greater than the upper threshold of the Schmitt trigger (U1A) which results in the output at U1A switching on. When this happens, the voltage on the negative plate of C1 begins to increase which results in the output voltage of U1B falling (the falling edge of the triangular wave). When the output voltage falls below the Schmitt triggers lower threshold, the voltage output of the Schmitt trigger falls to 0V and this cycle repeats indefinitely. 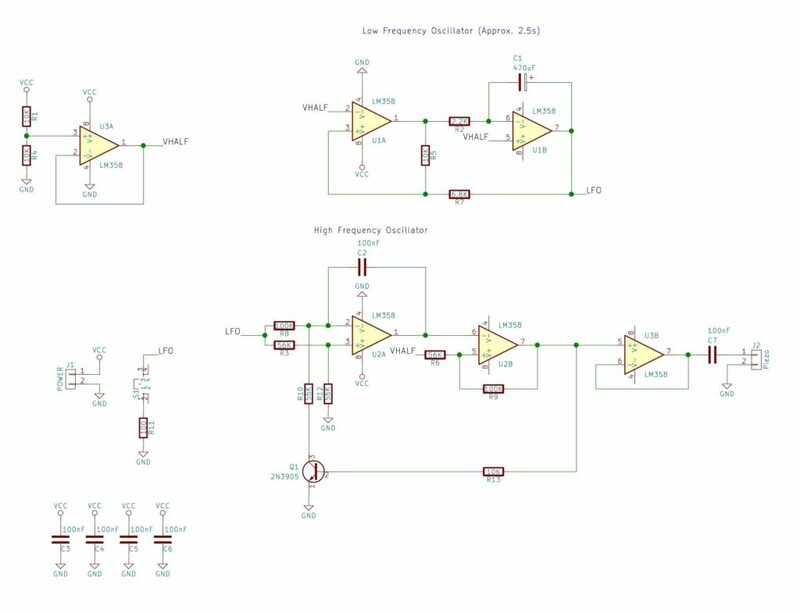 The LFOs time period is around a few seconds and this will be used to modulate the output frequency of the second circuit, the VCO. The VCO has four main sections; the integrator (U2A), inverting Schmitt trigger (U2B), reset circuit (Q1), and a buffer (U3B). So while the VCO is oscillating, the LFOs output voltage is constantly changing which results in the VCOs output frequency also changing. This modulated wave is fed into a buffer (U3V) which is then fed into a speaker or piezo disc. The result is a siren whose frequency constantly changes! 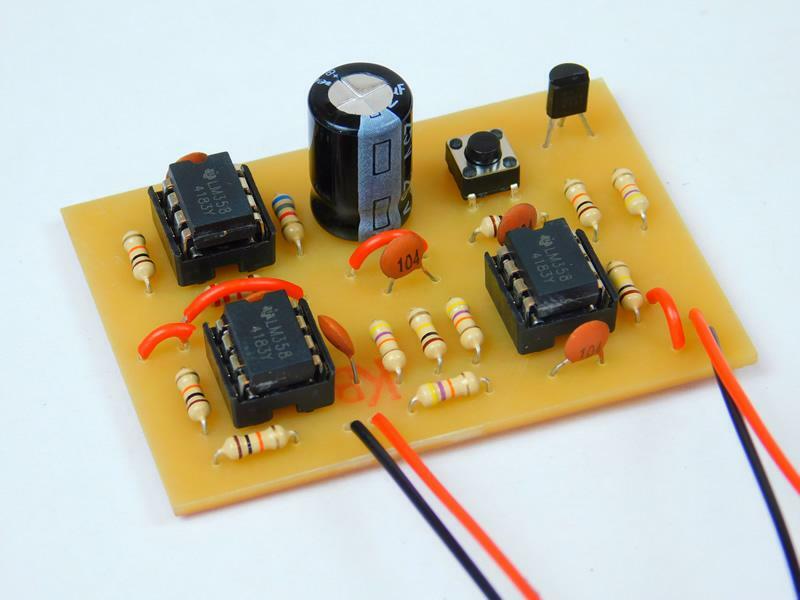 Making this project can be done with most circuit construction techniques due to the lack of surface-mount components and the use of highly common parts (i.e., LM358). Some examples of circuit techniques that work well with this project include stripboards, veroboard, matrix board, and solderless breadboard. However, in this project, I used a PCB as they are more convenient than a circuit using many wires. All of the project files can be found in a zip below which include the KiCad schematic, KiCad PCB files, Gerber files, and the needed G-Code CNC files.